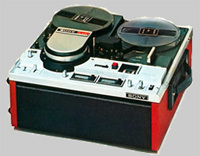 Usually, the tapes manufactured between 1965 and 1985 experience an hydrolisation problem. We master the treatment to solve the problems of these tapes or cassettes. tapes up to 26,5 cm or 10 ½ inches (NAB or NO) in diameter, in every speed, in 2 or 4 tracks.